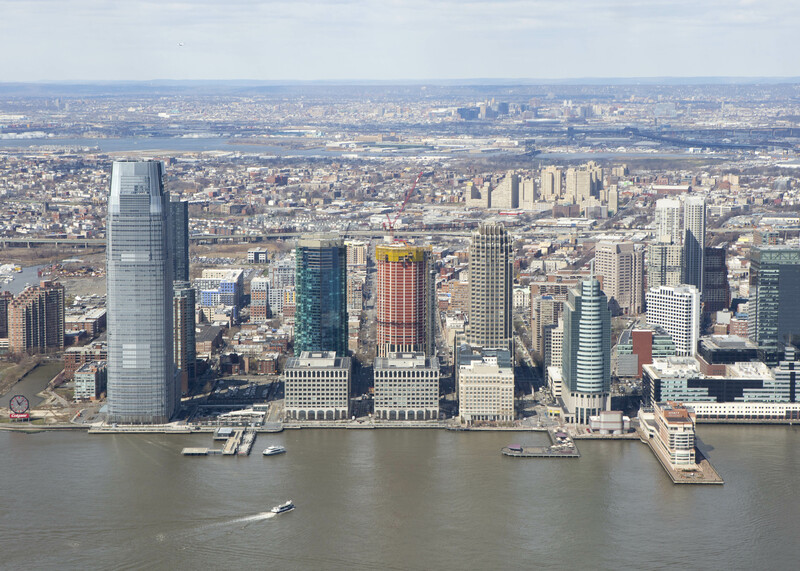 While Manhattan’s construction boom is now resulting in towers crossing the 1,000-foot mark on what seems to be a monthly basis, the first near-supertall across the Hudson is also making rapid progress. 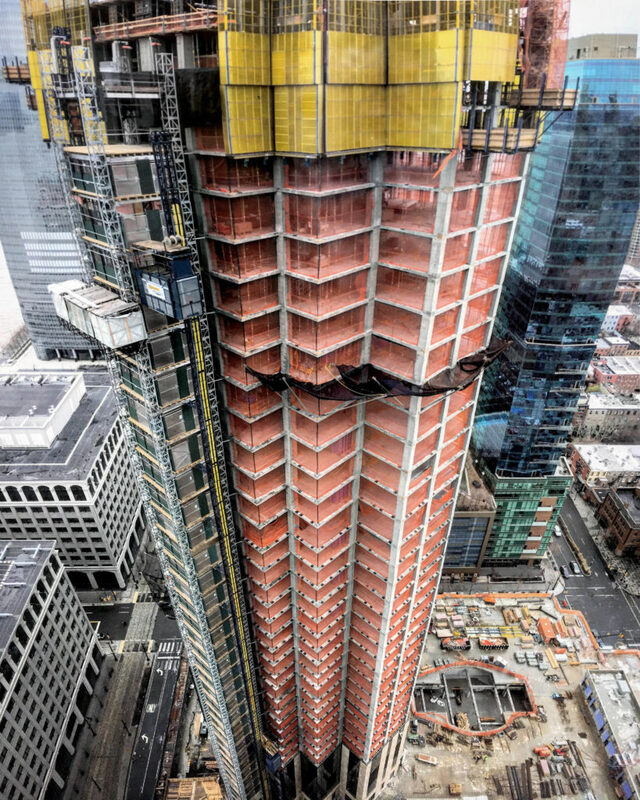 99 Hudson Street has officially crossed the halfway point to its final height of 900 feet. Once complete, the building will become the tallest skyscraper in both Jersey City, and all of New Jersey. 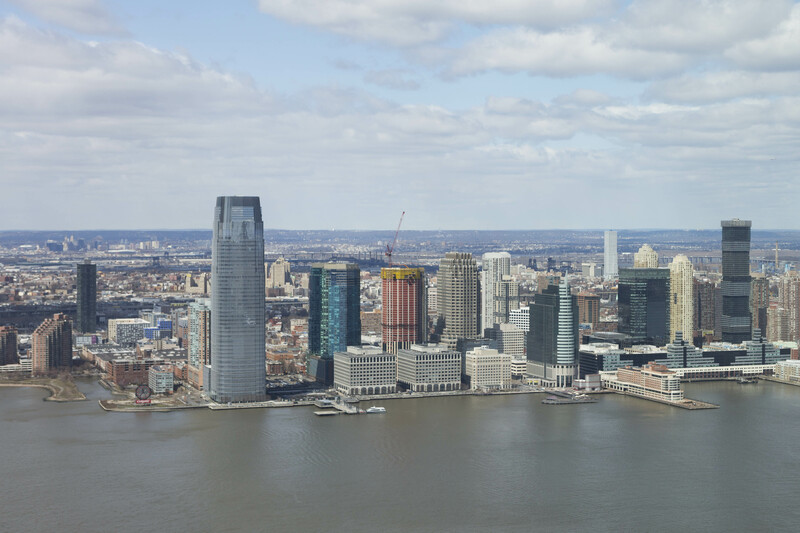 Even at under 500′, the tower is already making an impact on the skyline, as seen from Lower Manhattan and the surrounding real estate fronting New York Harbor. 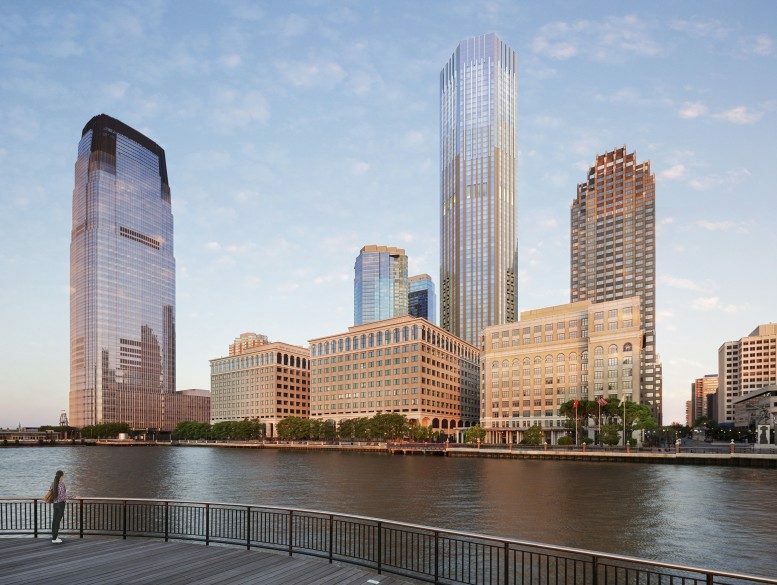 Designed by Perkins Eastman and owned by investment & development firm China Overseas America, the 79-story project aims to take advantage and build upon the changing and growing reputation of Jersey City. The proximity and views of Manhattan are also major advantages. Along with 15,000 square feet of new retail space, the project site comes with the benefit of close proximity to mass transit, local dining and entertainment, and easy access to New York City. The base features a private port-cochere adjacent to the main lobby, which is an enormous space in and of itself. In total, the site will yield around 1.4 million square feet of new real estate. 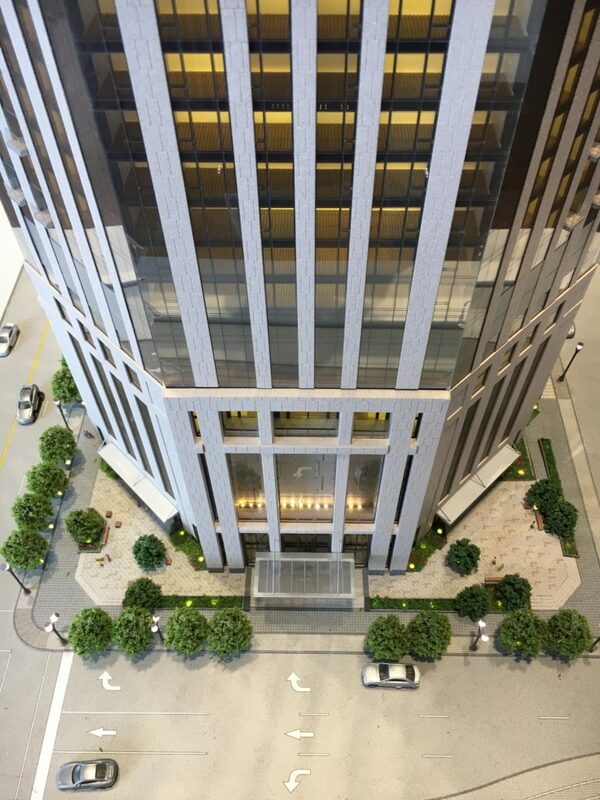 The design of the building calls for the main tower and lobby to be located on the eastern section of the property along Hudson Street. 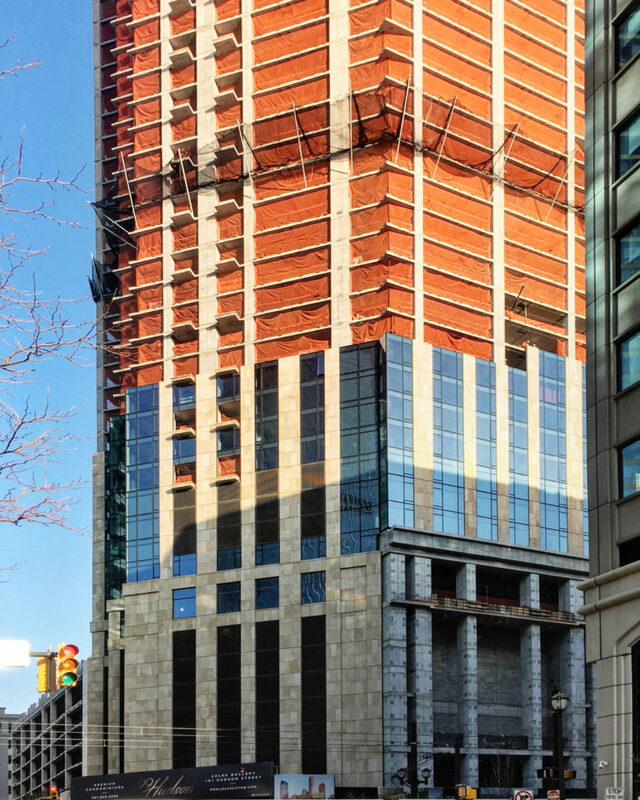 The facade aims to blend with the surrounding buildings of downtown Jersey City, using a mix of glass and Jura limestone, to be installed by Vidaris, Inc, while reaching for new and unchallenged heights above the skyline thanks to DeSimone Consulting Engineers. Cladding began last October, and is rising above the podium of the building. The outdoor amenity level is taking shape as well, with the outdoor swimming pool the last part of the floor to be created. Large concrete beams are being used to support the weight of the water and the pool itself. The pool and amenities will total 65,000 square feet, occupying floors eight and nine, above the parking garage. 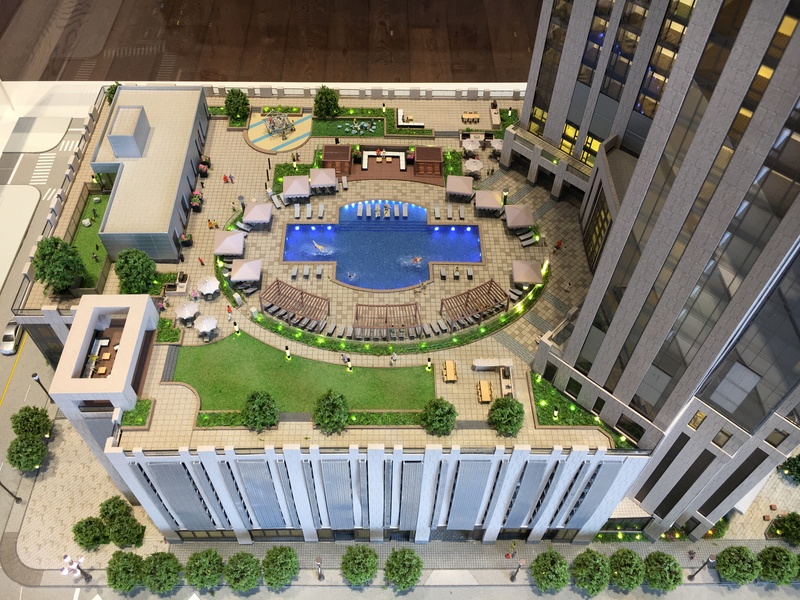 The pool will be ringed by cabanas and seating areas, while a children’s playground and barbecue grills will also be offered. Other amenities include fitness centers for yoga and weights, a spa with its own indoor pool, a golf simulator, and a screening room. Below the amenities sits the seven-story parking garage, hidden behind the limestone facade, which occupies the western section of the site along Greene Street. The garage is connected to the private porte-cochere. At street level, 7,500 square feet of new pedestrian plazas and greenery will surround the perimeter of the building. Sales have already launched and apartments will range from one-bedrooms starting in the $770,000s to two-bedroom units starting at $1.5 million. Some units will include exterior balconies that overlook the New York skyline. The penthouses will start on the 75th floor, with prices and floor plans yet to be revealed. Construction is set to finish early next year. 2 Comments on "Inside Look as 99 Hudson Street Surpasses Halfway Point to 900′ Pinnacle"
Please pardon me for using your space: Advantage on 99 Hudson Street, and you know? I like its sharp-shaped. There is a 99 Hudson in Manhattan you know.